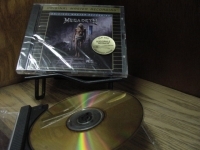 MFSL 24K Gold CD - items 125 to 150 Shop MyMusicFix!! 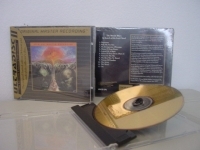 "Johnny Winter, Second Winter - FACTORY SEALED MFSL 24-Karat Gold CD - LAST COPY"
MFSL 24K GOLD CD. This great Blues Rocker really established his reputation with Second Winter. He plays Classic Rock n Roll in a new Blues Fusion style with songs like - Slippin' n Slidin' - Miss Ann - Johnny B. Goode - and a cover of Bob Dylans Highway 61 Revisited. A must for any Rockin Blues Winter fan. Includes extra photographs (not included in original Album). 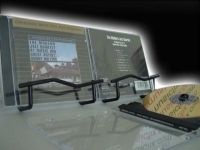 "Joni Mitchell, Wild Things Run Fast - CURRENTLY OUT OF STOCK"
MFSL 24K GOLD CD. "Wild Things Run Fast" is for Joni Mitchell fans. The brilliance begins with the pairing of "Chinese Cafe" with "Unchained Melody" for an enchanting medley. The upbeat Joni tunes have fabulous melodies and fun, yet meaningful lyrics such as these treasures: "Wild Things Run Fast" "Be Cool" "You Dream Flat Tires" "Yours So Square Baby I Don't Car"
"Keith Richards, Talk is Cheap - MFSL Gold CD"
MFSL 24K GOLD CD Track listing 1. Big Enough 2. Take It So Hard 3. Struggle 4. I Could Have Stood You Up 5. Make No Mistake 6. You Don't Move Me 7. How I Wish 8. Rockawhile 9. Whip It Up 10. Locked Away 11. It Means A Lot Details Playing time: 47 min. Contributing artists: Bernie Worrell, Bootsy Collins, Buckwheat Zydeco & Co., Ivan Neville, Johnnie Johnson, Maceo Parker, Michael Doucet, Patti Scialfa Producer: Keith Richards, Steve Jordan Distributor: n/a Recording type: Studio Recording mode: Stereo SPAR Code: AAD Album notes Personnel includes: Keith Richards (vocals, guitar, percussion); Waddy Wachtel (guitar); Michael Doucet (violin); Stanley "Buckwheat" Dural (accordion); Maceo Parker (alto saxophone); Bobby Keys (tenor & baritone saxophone); Johnnie Johnson (piano); Ivan Neville (piano, keyboards); Bernie Worrell (organ, clavinet); Chuck Leavell (organ); "Bootsy" Collins, Joey Spampinato (bass); Charley Drayton (bass, drums, vocals), Steve Jordan (drums, percussion, bass, background vocals); Sarah Dash, Patti Scialfa, Sam Butler (background vocals). Recorded at Air Studios, Montserrat, Switzerland and Le Studio, Montreal, Canada. All songs co-written by Keith Richards and Steve Jordan. The first solo outing from Mr. Rock & Roll himself, TALK IS CHEAP is a solid, rootsy effort with something for everyone. The opening cut, "Big Enough," mines a deep funk groove (abetted by veteran funksters Bootsy Collins and Bernie Worrell of Parliament/Funkadelic fame) and makes it clear that the set will not be pure Stones revival. While "Take It So Hard" kicks off with the clarion call of Keith Richards's signature guitar sound and echoes the vibe of Stones songs "Happy" and "Tumbling Dice," it lays claim to its own distinctive mood. "I Could Have Stood You Up" hearkens back to the swinging rock of the 1950s, complete with doo-wop backing vocals and honky-tonk piano, before segueing into mid-tempo, emotive tracks "Make No Mistake" and "You Don't Move Me," that recall late-'70s Dylan. Approaching the album's end, the melancholic "Locked Away" provides an antidote to the head-bobbing rhythm of "Rockawhile" and the angular closing punch of "It Means a Lot." Richards's understated vocal delivery and blues-drenched guitar lines (which manage to sound simultaneously clean, spare, and gloriously sleazy) earmark this fine collection of tunes. "Loggins & Messina, Full Sail - Factory Sealed MFSl Gold CD"
MFSL 24K GOLD CD. Tracks Include: "Lahaina" "Travelin' Blues" "My Music" "A Long Love" "You Need A Man/Coming To You" "Watching The River Run" "Pathway To Glory" "Didn't Know You When" "Sailin' The Wind". "Louis Armstrong & Duke Ellington, Together For The First Time - MFSL Gold CD"
Together For The First Time/The Great Reunion [Gold Disc CD] Track listing 1. Duke's Place 2. I'm Just A Lucky So And So 3. Cotton Tail 4. Mood Indigo 5. Do Nothin' Till You Hear From Me 6. Beautiful American, The 7. Black And Tan Fantasy 8. Drop Me Off In Harlem 9. Mooche, The 10. In A Mellowtone 11. It Don't Mean A Thing 12. Solitude 13. Don't Get Around Much Anymore 14. I'm Beginning To See The Light 15. Just Squeeze Me 16. I Got It Bad And That Ain't Good 17. Azalea Details Playing time: 68 min. Contributing artists: Barney Bigard, Danny Barcelona, Mort Herbert, Trummy Young Producer: Bob Thiele Distributor: n/a Recording type: Studio Recording mode: Stereo SPAR Code: AAD Album notes Full performer name: Louis Armstrong/Duke Ellington. THE GREAT REUNION was recorded April 3, 1961. Includes liner notes by Stanley Dance. 2 LPs on 1 CD. 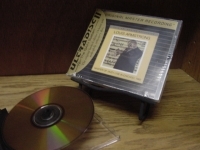 "Louis Armstrong, Master Of Jazz: Live In Chicago- MFSL Gold CD"
Master Of Jazz: Live In Chicago 1962 [Gold Disc CD] This is a tremendously rare MFSL pressing which offers LP in one 24K Gold CD Masterpiece. Could be one of the last Factory Sealed copy left in the world. Don't Miss Out. COLLECTORS NOTE: THIS TITLE IS IN COLLECTORS CONDITION WITH NO STORE STICKERS EVER ATTACHED. ALSO INCLUDES J-CARD. Track listing 1. When I'ts Sleepy Time Down South 2. Indiana 3. Give Me A Kiss To Build A Dream On 4. Bucket's Got A Hole In It, The 5. Tiger Rag 6. Mack The Knife 7. Blueberry Hill 8. When The Saints 9. Ole Miss 10. When I Grow Too Old To Dream - (bonus track) 11. Basin Street Blues - (bonus track) 12. High Society Calypso 13. C'est Si Bon 14. La Vie En Rose 15. Faithful Hussar, The 16. Once In A While - (bonus track) 17. When It's Sleepy Time Down South Details Distributor: n/a Recording type: Live Recording mode: Stereo SPAR Code: n/a Album notes Ultradiscs are mastered from the original master tapes using Mobile Fidelity's proprietary mastering technique, then plated with 24 karat gold and housed in a stress-resistant lift-lock jewel box. Personnel: Louis Armstrong (trumpet, vocals); Trummy Young (trombone); Joe Darensbourg (clarinet); Billy Kyle (piano); Billy Cronk (bass); Danny Barcelona (drums). Recorded live in Chicago, Illinois on August 1, 1962. Includes liner notes by Mike Hennessey. 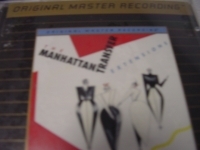 "Manhattan Transfer, Extensions - Last Copy"
"Marianne Faithfull, Broken English & Strange Weather"
MFSL 24K GOLD CD Track listing 1. Broken English 2. Witches' Song 3. Brain Drain 4. Guilt 5. Ballad Of Lucy Jordan, The 6. What's The Hurry 7. Working Class Hero 8. Why D'ya Do It 9. Strange Intro 10. Boulevard Of Broken Dreams 11. I Ain't Goin' Down To The Well No More 12. Yesterdays 13. Sign Of Judgement 14. Strange Weather 15. Love Life And Money 16. I'll Keep It With Mine 17. Hello Stranger 18. Penthouse Serenade 19. As Tears Go By 20. Stranger On Earth, A Details Playing time: 76 min. Contributing artists: Bill Frisell, Darryl Way, Garth Hudson, Mac "Dr. John" Rebennack, Maurice Pert, Robert Quine, Steve Winwood Distributor: n/a Recording type: Studio Recording mode: Stereo SPAR Code: n/a Album notes BROKEN ENGLISH: Personnel: Marianne Faithfull (vocals); Diane Birch, Frankie Collins, Jim Cuomo, Guy Humphries, Joe Mavety, Maurice Pert, Barry Reynalds, Terry Stannard, Darryl Way, Steve Winwood, Steve York. Producer: Mark Miller Mundy. Engineer: Bob Potter. Recorded in 1979. Originally released on Island in 1979. STRANGE WEATHER: Personnel: Marianne Faithfull (vocals, tambourine); Bill Frisell (acoustic guitar, guitar); Robert Quine (guitar); Fernando Saunders (guitar, bass); Michael A. Levine (concertmaster); Marin Alsop, Marshall P. Coid, Nancy McAlhany, Marion Pinhheiro, Laurie Seaton (violin); Christine Ims, Ronald Lawrence (viola); Mark Shuman, Mary Wooten (cello); Chris Hunter (flute, alto saxophone); Alex Foster (clarinet); Lenny Pickett (clarinet, tenor saxophone); Bob Mintzer (bass clarinet); William Schimmel, Garth Hudson (accordion); Steve Slagle (alto & baritone saxophones); Richard Perry (tenor saxophone); Glenn Drewes, John Marshall, Lew Soloff (trumpet); Conrad Herwig, Birch Johnson (trombone); Sharon Freeman (piano); Mac Rebennack (piano, electric piano); J.T. Lewis (drums). Producer: Hal Willner. Engineer: Joe Ferla. Recorded at A&R Recording Studios and Record Plant Studios, New York; Bearsville Studios, Bearsville, New York. Originally released on Island in 1987. Includes original release liner notes by Hal Willner and Terry Southern. "Mel Torme & Buddy Rich, Together Again For The First Time - Sealed MFSL Gold CD"
Together Again--For The First Time Gold Disc CD Track listing 1. Blues In The Night 2. Here's That Rainy Day 3. Lady Be Good 4. Bluesette 5. When I Found You 6. You Are The Sunshine Of My Life 7. You Are My Sunshine 8. I Won't Last A Day Without You Details Producer: Norman Schwartz Distributor: n/a Recording type: Studio Recording mode: Stereo SPAR Code: n/a Album notes Personnel: Mel Torme (vocals); Buddy Rich (drums); Phil Woods (alto saxophone); Chuck Wilson, Alan Gauvin, Steve Marcus, Gary Pribek, Greg Smith (saxophone); Chuck Schmidt, Dean Pratt, John Marshall, Dave Kennedy (trumpet); John Mosca, Dale Kirkland, Dave Boyle (trombone); Tony Price (tuba); Hank Jones (piano); Tom Warrington (bass). Recorded at RCA Studios, New York, New York in January 1978. Includes liner notes by Leonard Feather, Mel Torme, Buddy Rich, Norman Schwarz and Glen Glancy. Fans of Mel Torme and Buddy Rich (and of the album they recorded together in 1975) will rejoice to know that TOGETHER AGAIN FOR THE FIRST TIME, which pairs the Velvet Fog with Buddy Rich's Orchestra, was finally issued on CD in 2006. The mode is big band swing with pop leanings, and while Torme doing Stevie Wonder's "You Are the Sunshine of My Life" might seem a bit odd, who's complaining when Torme is in such fine voice? "Blues in the Night" and Torme's tribute to the great Ella Fitzgerald on a modified version of "Oh, Lady Be Good" are the disc highlights, and fans of Rich's drumming won't be disappointed with the bandleader's fine solo spots. 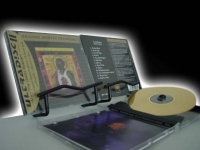 "MFSL Ultradisc CD-R - Five Gold CDs in Package"
MFSL ULTRADISC CD-R - The ultimate archival media by Mobile Fidelity Sound Lab - 74 minutes Package of Five 24-Karat Gold CD-Rs with lift-lock jewel cases. Compatible with all CD-R Recorders. Are 99.99% pure 24-Karat Gold with a life span of 300 years. Superior reflectivity - scratch resistant - heat and UV resistant - precision pit formation - 4 levels of quality control - Tech Specifications: MFSL 24 KT Gold ULTRADISC CD-R Anyone who has ever damaged a CD-R through abrasion or excessive exposure to heat or light knows that CD-Rs are an imperfect technology and it's all too facile and common to lose priceless data. 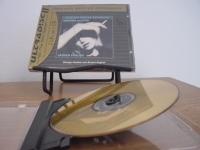 For occasions when you can't afford to endanger your data, Mobile Fidelity Sound Lab is proud to introduce the Ultradisc CD-R. Our 24KT Gold ULTRADISC CD-R is designed for professional, data critical, music and graphic archival applications, and all other data storage where there is no margin for loss or error. These specially-gold-plated ULTRADISC CD-Rs ensure excellent reflectivity, are non corrosive, and have dramatically enhanced resistance to light and heat. Additional features include instantaneous pit burning (burst burning) for superior pit formation and extremely low to no error rate; and an added, patented, scratch resistant, protective surface. Due to these features, little if any error correction is required upon retrieval of information, producing precise reproduction of stored data. Whereas the average CD-R has a projected lifespan of only 20 years--if stored in ideal conditions, our accelerated aging tests predict that the 24KT Gold ULTRADISC CD-R will retain its specifications for more than 300 years. Meaning that, now, information can be accurately stored and retrieved longer than ever before. 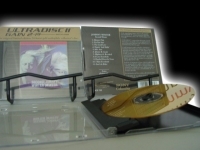 24 KT Gold Layer Mobile Fidelity Sound Lab created the world's first 24 Karat Gold music CD in 1987: The ULTRADISC. 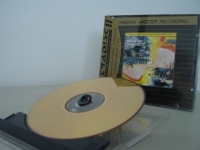 Now MFSL has put that expertise in the development of the 24KT Gold ULTRADISC CD-R. The combination of the superior reflectivity and longevity of 99.99% pure 24 Karat Gold, in addition to a specialized, patented bonding agent, ensures that the ULTRADISC CD-R will never oxidize and fail to output information, as many commercially available CD-Rs do. The ULTRADISC CD-R is extremely stable in the real world environment. Proprietary Photosensitive Dye Unlike commonly used CD-Rs containing Cyanine (blue/green dye) or Metal Azo (deep blue dye), which lose their characteristics quickly from exposure to light and heat, the 24KT Gold ULTRADISC CD-R utilizes a patented photosensitive dye which ensures accurate burning and stability, plus exceptional longevity and durability. Whereas the two other types of dye are formed with linear molecular structures, which break down easily when exposed to the elements, the unique photosensitive dye utilized in the ULTRADISC CD-R has an annular structure which forms a strong and extremely stable chemical bond. On top of this, MFSL has added a patented, reinforcing coating for extra protection from scratching. 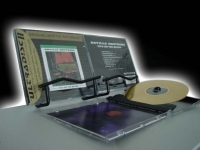 Extremely Accurate and Precise Burning Mobile Fidelity Sound Lab has chosen to offer only slower speed (1-12X) CD-Rs. Although the current trend is "faster is better," MFSL engineers strongly disagree and urge audio professionals, archivists, audiophiles, and discriminating collectors alike to burn their data in real time, better known as 1X. Through a careful battery of tests conducted at Mobile Fidelity Sound Lab, we have observed that real-time burning has always yielded superior results. Higher burning rates cause errors and do not allow for proper pit formation. Furthermore, higher speeds cause vibration in the drive when burning the disc, thereby increasing jitter. In order to attain even higher burning accuracy and overall quality, a specially formulated dye was created for these slow-burn, precision ULTRADISC CD-Rs. Accurate and Precise Information Retrieval The ULTRADISC CD-R's specialized dye reacts more quickly to the writing laser than do other dyes. It reacts in a "burst" mode instead of the sluggish "melt" mode. Due to this instantaneous reaction, precise pit edges are formed. This is crucial for the laser pickup to accurately interpret the information, and thereby reducing or eliminating the use of interpolation/error correction circuitry. 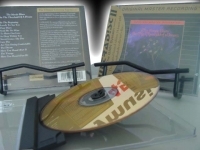 Additionally, a specially formulated, black ink is used to coat one side of the disc in order to reduce stray reflections which could alter readings. Ultra Quality Control - 4 Levels of QC Utilizing the highest quality control standards in the industry, all the manufacturing and packaging of the ULTRADISC CD-R is done in state-of-the-art cleanroom conditions. 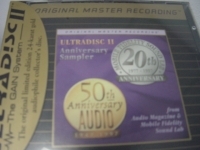 Mobile Fidelity Sound Lab has rejected random sampling techniques, which are simply not stringent enough for critical data storage applications. Instead, MFSL utilizes an unprecedented 4-level quality control process. First, a sample out of every 3,000 discs is tested, critically examined and evaluated for over 2 hours until given the approval for MFSL specifications. Second, every single ULTRADISC CD-R is tested as it comes off the replication line. High tech, extremely sophisticated computer analysis is used to test jitter, thickness tolerances, gold uniformity and disc eccentricity. Third, an inspector (wearing medical gloves) picks up and visually examines the ULTRADISC CD-Rs for pinholes, gold consistency, oyster shelling, or any other anomalies. Fourth, another inspector repeats this very time-consuming, manual/visual examination just before the specialized, stray-reflection-reducing black coating is applied. 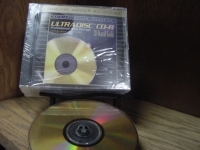 ULTRADISC CD-Rs have to pass all levels of QC before they can be shipped. 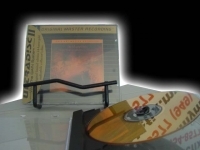 If a disc does not pass Mobile Fidelity Sound Lab's elevated specifications, it will not be accepted as an ULTRADISC CD-R. 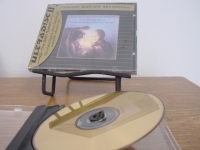 This is MFSL's guarantee to the user that every ULTRADISC CD-R is the finest engineered recordable CD media available in the world.Limited Lifetime Guarantee After creating a CD-R that would last a lifetime, MFSL backed it up with a limited lifetime guarantee. 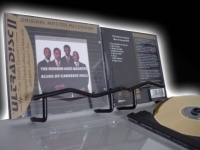 "MFSL Ultradisc II, Anniversary Sampler - CURRENTLY OUT OF STOCK"
"Modern Jazz Quartet, At Music Inn"
"Modern Jazz Quartet, Carnegie Hall - MFSL Gold CD"
"Moody Blues, A Question Of Balance - Factory Sealed MFSL Gold CD"
A Question of Balance - Factory Sealed MFSL Gold CD Track listing 1. Question 2. How Is It (We Are Here) 3. And the Tide Rushes In 4. Don't You Feel Small 5. Tortoise and the Hare 6. It's up to You 7. Minstrel's Song 8. Dawning Is the Day 9. Melancholy Man 10. Balance, The Details Playing time: 38 min. Producer: Tony Clarke The Moody Blues: Justin Hayward, Graeme Edge, John Lodge, Mike Pinder, Ray Thomas. Engineers: Derek Varnals, Adrian Martins, Robin Thompson. Includes liner notes by John Reed. All tracks have been digitally remastered. A beautifully remastered version of the Moodies' 1970 back-to-basics album (translation: they cut way back on the overdubs) with the original aural murk stripped away at last, and informative liner-note interviews with the band about the recording process. Standout tracks include the classic sort-of protest song "Question" and "It's Up to You," one of singer/guitarist Justin Hayward's most authoritatively wistful riff-rockers. The prettiest track is Ray Thomas's "And the Tide Rushes In," a psychedelic ballad of the sort that moved the Who's Pete Townshend to remark that the Moody Blues' albums were so gorgeously produced that listening to them was like "being in church." "Moody Blues, Days Of Future Passed - MFSL Factory Sealed Gold CD"
Track listing 1. Day Begins, The 2. Dawn: Dawn Is A Feeling 3. Morning: Another Morning, The 4. Lunch Break: Peak Hour 5. Afternoon: Forever Afternoon, The (Tuesday?) 6. Evening: Evening (Time To Get Away) / The Sun Set / Twilight Time 7. Night: Nights In White Satin, The Details Playing time: 41 min. Producer: Hugh Mendl Distributor: n/a Recording type: Studio Recording mode: Stereo SPAR Code: AAD Album notes Additional personnel: Peter Knight (conductor); The London Festival Orchestra. Includes liner notes by Hugh Mendl. DAYS OF FUTURE PASSED is the Moody Blues' true contribution to rock history: the most cohesive integration of rock songs with orchestral music ever produced. Asked by Deram Records to create a rock reworking of Dvorak's "New World" Symphony, the Moodies instead wrote their own symphony, a song cycle that describes the emotions that accompany each part of the day, from dawn ("Dawn Is A Feeling") to night (the classic "Nights In White Satin"). The songs are connected by lush orchestral passages in which the basic musical themes are reworked. Meanwhile, the band had already begun to sound like its own orchestra, using signature Mellotron string sounds, flutes, tympani and multiple vocalists. 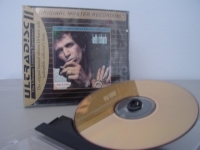 "Moody Blues, Every Good Boy Deserves a Favour"
MFSL 24K GOLD CD "Last Copy". Tracks Include: "Procession" "Story In Your Eyes" "Our Guessing Game" "Emily's Song" "After You Came" "One More Time To Live" "Nice To Be Here" "You Can Never Go Home" "My Song"
"Moody Blues, Every Good Boy Deserves Favour - Factory Sealed MFSL Gold CD"
MOODY BLUES - EVERY GOOD BOY DESERVES FAVOUR - MFSL SEALED 24 Karat GOLD CD. Long Out of print masterpiece & our last copy forever. The heir to the Progressive Rock throne abdicated by The Beatles in 1969, the celestial rock of the Moodys was a state of the art rage. Sonicly compiled by the magical mellotron sounds of the founding member, Mike Pinder, the universal music message of Moody's magic took rock to its highest levels of the post-Sgt. Pepper music scene. This stunning Audiophile quality sound is the finest and the best way to experience this Top 10 classic from the vintage year of 1971. The Moodys were at the peak of their mini-orchestra phase here. 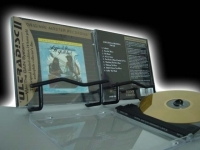 A lush, multi-layered recording which contains the hit song - Story In Your Eyes and much more. 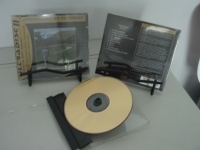 "Moody Blues, In Search Of The Lost Chord - CURRENTLY OUT OF STOCK"
MFSL 24K GOLD CD "Last Copy". Tracks Include: "Departure" "Ride My See-Saw" "Dr. Livingstone, I Presume" "House Of Four Doors" "Legend Of A Mind" "House Of Four Doors" "Voices In The Sky" "The Best Way To Travel" "Visions Of Paradise" "The Actor" "The Word" "Om"
"Moody Blues, On The Threshold of a Dream - Factory Sealed MFSL 24-Karat Gold CD"
MFSL 24K GOLD CD. This 1969 release features the purveyors of classical rock in all their sonic splendor. Track listing 1. In the Beginning 2. Lovely to See You 3. Dear Diary 4. Send Me No Wine 5. To Share Our Love 6. So Deep Within You 7. Never Comes the Day 8. Lazy Day 9. Are You Sitting Comfortably 10. Dream, The 11. Have You Heard (Part 1) 12. Voyage, The 13. Have You Heard (Part 2) Producer: Tony Clarke Recording type: Studio Recording mode: Stereo Album notes The Moody Blues: Mike Pinder, Justin Hayward, Ray Thomas, John Lodge, Graeme Edge. Additional personnel: Pete Jackson (triangle). Originally released on Deram (1035). Includes liner notes by John Reed. Digitally remastered by Steve Fallone (PolyGram Studios). The Moody Blues: Mike Pinder, Justin Hayward, Ray Thomas, John Lodge, Graeme Edge. Additional personnel: Pete Jackson (triangle). Includes liner notes by David Lymonds and Lionel Bart. Where this album's predecessor IN SEARCH OF THE LOST CHORD dipped deeply into Eastern-flavored psychedelia, THRESHOLD is more of a straightforward rock record. Things open up experimentally enough, with a spoken-word vignette over electronic drones, but this leads straight into one of the Moodies' poppiest, most up-tempo songs, "Lovely to see You," which would remain a concert favorite for decades. Even notoriously theatrical flautist/vocalist Ray Thomas keeps his eccentricities in check on his effective ballad "Dear Diary." Keyboardist Mike Pinder takes a surprisingly lascivious vocal turn on the anomalous, leering rocker "So Deep Within You." Justin Hayward provides the lion's share of ear-tickling moments with pretty folk-rock tunes such as "Never Comes the Day" and "Are you Sitting Comfortably," while the most adventurous piece "Have you Heard/The Voyage" extends over three discrete tracks, featuring complex instrumental passages and lush harmonies. THRESHOLD doesn't come off as an attempt to cater to the mainstream, it's just a more song-based, less exotic recording than its predecessors. 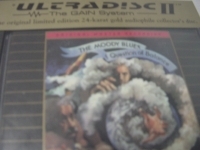 "Moody Blues, To Our Children's Children's Children - MFSL Factory Sealed Gold CD"
MFSL 24K GOLD CD. Originally Released in 1969, this was the first album on the Moody's Threshold Label. Critics call "To Our Children's Children's Children" the Moody Blues most personal recording and has the lush, rich sound that the Moody Blues are known for. 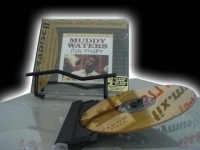 "Muddy Waters, Folk Singer - CURRENTLY OUT OF STOCK"
MFSL 24K GOLD CD. Originally released on Chess in 1964, this title has repeatedly surfaced on Audiophile's Top 20 Lists for its superior sound - Rare for most true pre-80's Blues recordings. This album is an all acoustic collection of recordings that illustrates his deep rooted rural Blues influences reminiscent of the recordings he made nearly 25 years prior in Mississippi. This release features Muddy Waters on Vocals and Guitar supported by the great Buddy Guy on Guitar, Blues Legend, Willie Dixon on Bass, and Clifton James on occasional Drums. "Neil Young, Old Ways (only one) - MFSL FACTORY SEALED 24-KARAT GOLD CD"
MFSL 24K GOLD CD. Old Ways" was recorded in various locations in Tennessee and Texas and released on the Geffen Label in 1985. Most of the tracks were produced by Neil Young, Ben Keith, and David Briggs. Elliott Mazer also co-produced three of the tracks. This is Neil like you have never heard him - a must for Neil Young collectors. Tracks include - "The Wayward Wind"- "Get Back To The Country" - "Are There Any More Real Cowboys?" - "Once An Angel" - "Misfits" - "California Sunset" - "Old Ways" - "My Boy" - "Bound For Glory" - "Where Is The Highway Tonight?". "Neville Brothers, Brother's Keeper - Factory Sealed MFSL Gold CD"
"Neville Brothers, Fiyo on the Bayou - Factory Sealed MFSL Gold CD"
MFSL 24K GOLD CD. Tracks Include: "Hey Pocky Way" "Sweet Honey Dripper" "Fire On The Bayou" "The Ten Commandments Of Love" "Sitting In Limbo" "Brother John/Iko Iko" "Mona Lisa" "Run Joe".